I joyfully meet you at the end of the formation course on marriage and family, promoted by the Diocese of Rome and the Tribunal of the Roman Rota. I address my cordial greetings to each of you, and I thank the Cardinal Vicar, the Dean of the Rota and all those who have collaborated for these days of study and reflection. They have given you the opportunity to examine the challenges and pastoral projects concerning the family, considered as a domestic church and a sanctuary of life. It is a vast, complex and delicate apostolic field, to which it is necessary to dedicate energy and enthusiasm, with the intention of promoting the Gospel of the family and of life. How can we not recall, in this regard, the broad and farsighted vision of my Predecessors, especially Saint John Paul II, who courageously promoted the cause of the family, decisive and irreplaceable for the common good of the peoples? In their wake I developed this theme, especially in the Apostolic Exhortation Amoris Laetitia, placing at the center the urgency of a serious journey of preparation for Christian marriage, which is not reduced to a few meetings. Marriage is not just a "social" event, but a true sacrament that involves an adequate preparation and a conscious celebration. The marriage bond, in fact, requires an engaged choice on the part of the engaged couple, which focuses on the will to build together something that must never be betrayed or abandoned. In various dioceses of the world initiatives are being developed to make family pastoral care more appropriate to the real situation, meaning with this expression in the first place the accompaniment of engaged couples to marriage. It is important to offer engaged couples the opportunity to participate in seminars and prayer retreats, which involve as animators, in addition to priests, also married couples with a consolidated family experience and experts in the psychological disciplines. So many times the ultimate root of the problems that come to light after the celebration of the sacrament of marriage is to be found not only in a hidden and remote immaturity suddenly exploded, but above all in the weakness of the Christian faith and in the non-ecclesial accompaniment, in the solitude in which usually the neo-spouses are left behind after the wedding celebration. Only faced with the daily life of life together, which calls the spouses to grow in a path of self-giving and sacrifice, some realize that they have not fully understood what they were going to start. And they find themselves inadequate, especially if they are confronted with the scope and value of Christian marriage, with regard to the concrete implications connected to the indissolubility of the bond, to openness to transmit the gift of life and fidelity. This is why I reiterate the need for a permanent catechumenate for the Sacrament of Marriage concerning its preparation, celebration and the first successive times. It is a shared journey between priests, pastoral workers and Christian spouses. Priests, especially parish priests, are the first interlocutors of young people who wish to form a new family and get married in the Sacrament of Marriage. The accompaniment of the ordained minister will help the newlyweds to understand that marriage between a man and a woman is a sign of the spousal union between Christ and the Church, making them aware of the profound meaning of the step they are about to make. The more the journey of preparation will be deepened and extended in time, the younger the couples will learn to correspond to the grace and strength of God and will also develop the "antibodies" to face the inevitable moments of difficulty and fatigue of married and family life. In the courses of preparation for marriage it is essential to resume the catechesis of Christian initiation to the faith, whose contents are not to be taken for granted or as if they were already acquired by the engaged couple. In most cases, however, the Christian message is all to be rediscovered for those who have remained stuck to some elementary notion of the catechism of the first Communion and, if all goes well, of Confirmation. Experience shows that the time of preparation for marriage is a time of grace, in which the couple is particularly open to listening to the Gospel, to welcoming Jesus as the teacher of life. Through a sincere attitude of welcoming couples, an adequate language and a clear presentation of the contents, it is possible to activate dynamics that overcome the widespread gaps today: both the lack of catechetical formation and the lack of a filial sense of the Church, which is also part of the foundations of Christian marriage. The greater effectiveness of pastoral care is realized where the accompaniment does not end with the celebration of the wedding, but "escorts" at least the first years of married life. Through interviews with the single couple and community moments, it is a matter of helping young spouses to acquire the tools and the supports to live their vocation. And this can only happen through a path of growth in the faith of the couples themselves. The fragility that, under this profile, is often found in young people who approach marriage makes it necessary to accompany their journey beyond the celebration of the wedding. And this - the experience tells us - is a joy for them and for those who accompany them. It is an experience of joyful motherhood, when newlyweds are the object of the attentive care of the Church which, in the footsteps of her Master, is a caring mother who does not abandon, does not discard, but approaches with tenderness, embraces and encourages. With regard to those spouses who experience serious problems in their relationship and find themselves in crisis, it is necessary to help them to revive faith and rediscover the grace of the sacrament; and, in some cases - to be assessed with rectitude and inner freedom - to offer appropriate indications to undertake a process of nullity. How many have become aware of the fact that their union is not a true sacramental marriage and want to get out of this situation, can find in the bishops, priests and pastoral workers the necessary support, which is expressed not only in the communication of legal norms but first of all in an attitude of listening and understanding. In this regard, the legislation on the new marriage process is a valid instrument, which requires to be applied concretely and indiscriminately by everyone, at every ecclesial level, since its ultimate reason is the salus animarum! 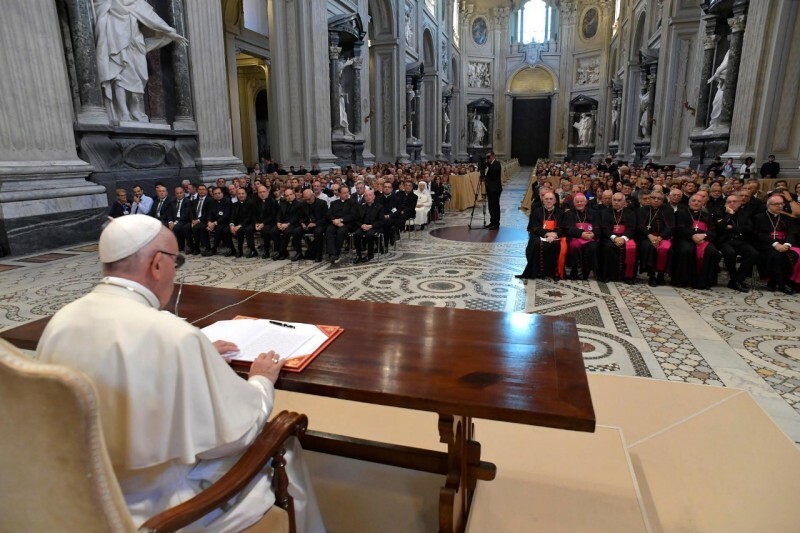 I was delighted to learn that many bishops and judicial vicars promptly welcomed and implemented the new marriage process, to comfort the peace of consciences, especially the poorest and far from our ecclesial communities. Dear brothers and sisters, I thank you for your commitment to the proclamation of the Gospel of the family. I hope that the horizon of the diocesan family ministry will be ever wider, assuming the style of the Gospel, meeting and welcoming even those young people who choose to live without getting married. The beauty of marriage must be witnessed to them! May the Holy Spirit help you to be operators of peace and consolation, especially for those who are more fragile and in need of support and pastoral care. I cordially impart my blessing and ask you to please pray for me.